Mercedes’ Valtteri Bottas has finished Friday on top of the timesheets at the Shanghai International Circuit, edging Sebastian Vettel by only 0.027s at the end of the latter 90-minute session. 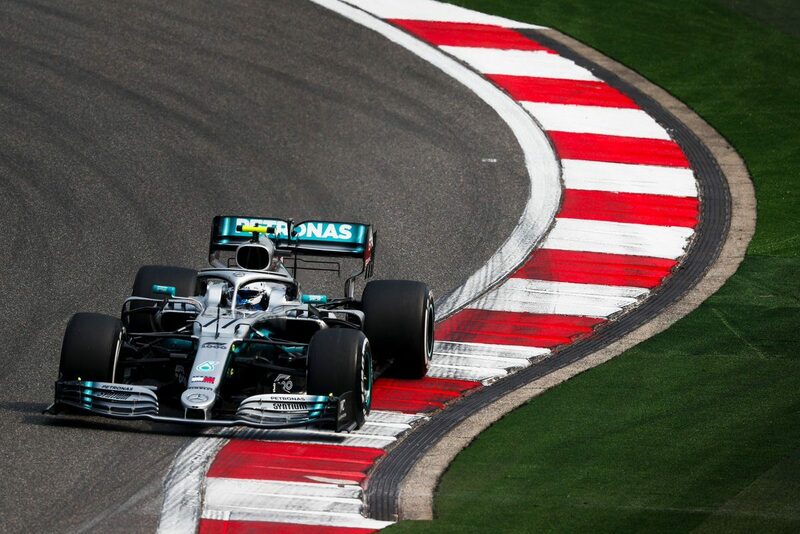 The Silver Arrows closed down the gap in Practice 2 after Ferrari’s Vettel led five-time Formula 1 world champion Lewis Hamilton by over two tenths of a second on a slower tyre compound in the opening session of the weekend. Bottas’ chart-topping time of a 1:33.330s leaves a curious question mark over the pecking order heading into the milestone weekend. Max Verstappen finished the afternoon session in third position, two tenths off the pace in his Honda-powered RB15. The Dutchman enjoyed a strong day in his Red Bull outfit after he placed fourth during the morning session. Meanwhile, Vettel’s teammate Charles Leclerc had a more worrying afternoon after he was forced to sit out for the final 20 minutes when his mechanics conducted cooling system checks. Leclerc ended his day in a lowly seventh position behind Renault’s Nico Hulkenberg and McLaren’s Carlos Sainz in fifth and sixth respectively. Hamilton sat fourth in the timesheets at the end of Friday after he and Bottas suffered on their cold tyres early in the session. The pair were seen spinning during their out laps while negotiating the opening complex of corners before further locking their front tyres into heavy braking zones of Turns 6 and 14. Huge tyre degradation and the relative lack of support racing around the 5.451km circuit makes it difficult for drivers to tame the highly technical circuit. Hulkenberg’s fifth place was an encouraging end to the day for Renault after Daniel Ricciardo concluded the opening practice session in sixth. The 29-year-old could only manage ninth in the afternoon, and was the first of those over one second off Bottas’ time. McLaren finished on song again with Sainz and rookie Lando Norris both lapping within the top 10. The duo improved on their morning session times which saw Norris and Sainz lap around 1.7s away from the leaders. Pierre Gasly rounded out the top 10 with 32 laps to his name in the second Red Bull Racing Honda. He led Alfa Romeo Racing’s Kimi Räikkönen in 11th while his rookie team-mate Antonio Giovinazzi could only manage 18th in the timesheets after he missed all of FP1 with a power unit issue. The 25-year-old made up for his lost time chalking up the most laps (40) of the whole field in the afternoon. The pairings of Toro Rosso, Racing Point and Haas all followed filling positions 12th to 17th. Haas’ Romain Grosjean endured an awkward afternoon session suffering a minor front wing failure on his way into Turn 1 during some of his fast-paced runs on the red-marked soft compound tyre. Despite finishing ahead of his team-mate, the Frenchman could only manage 17th on the soft compound. The Williams duo of Robert Kubica and George Russell once again rounded out the final times as they continue to look for pace in their troubled FW42 machines. The F1 cars return to the track tomorrow morning when Practice 3 commences at 1300 AEST, with Qualifying from 1600 AEST.